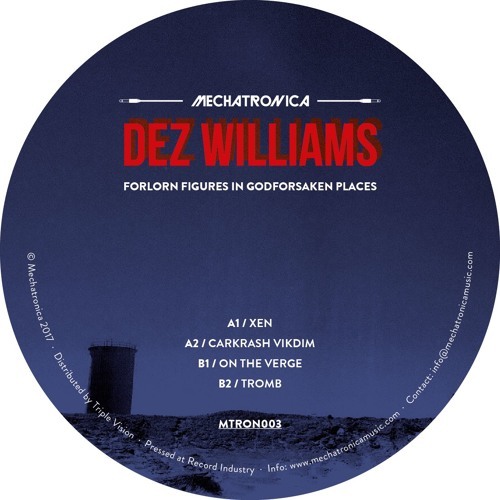 Still when the influence of Dez Williams’ track “Only Way I Know” on the recent Mechatronica sampler is hard to disappear, the producer from Holy Island off the Welsh coast returns to Berlin’s electro imprint with a new EP, which is the label’s first solo effort after two mini compilations. Although qualified for conceiving nasty acidbangers, from the very beginning Williams’ special love has belonged to electro and here we have another proof of his trade skills. “Xen” opens as a standard electro track that would match I-F’s classic output with growling 808 and laser sword stabs, the vocal part providing some words of wisdom. Gloomy “Carkrash Vikdim” that motors along with junglist vibes, surrounded by screams and suffering, would serve as a road safety newsflash. With a melodic drive and captivating bass line, futuristic “On The Verge” is a standout tune that has invited an occasional cellist onboard, for a bliss of almost seven minutes. Sounding heavy-footed and less appealing at first instance, “Tromb” gradually uncovers its qualities when revolving around creaky breaks and the bass meter facing the red.